1. The Original IDT™ System Integrated Dual Feed only from PFAFF® for over 45 years! A PFAFF® exclusive feature that delivers absolutely even fabric feed from both the top and the bottom, and ensures perfect seams on all fabrics. 2. 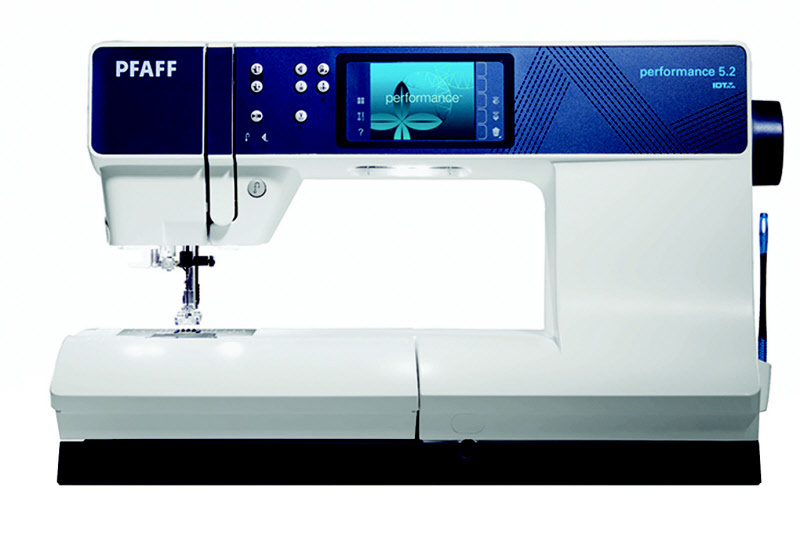 The PFAFF® performance™ 5.2 sewing machine is the perfect choice for quilters, home decor sewers, fashion enthusiasts – anyone who creates. The sewing area to the right of the needle is supersized for sewing large amounts of fabric or batting. 3. A Wide Variety of Beautiful 9mm Stitches from a choice of over 300, with 4 built-in stitch fonts and tapering on 9mm decorative stitches. Stitches include utility stitches, buttonholes, 9mm wide decorative stitches, quilt stitches, cross stitches and hemstitches. 4. Integrated patchwork program remembers the seam length to repeat over and over. This can be used with both utility and decorative stitches. 5. LED lights provide optimum illumination of the the entire work area with no shadows, or ecessive heat!